I got stood up for a job interview this evening!!! I had been trying to meet with this person since sometime in April… so three months now? I was looking forward to finally figuring out what this job would be all about, whether it would be a good fit, etc. and then they never showed up. Frustrating! Instead of all that, lets go to our Happy Place and talk about wool. 🙂 I had not been spinning too much and that made me sad, so I’m trying to spin a little bit every day. I wasn’t on the ball enough to take part in Toure de Fleece (I think I missed the first few days) but I’m still enjoying seeing everybody else’s progress and it’s making me want to spin more! I’ve just finished spinning up the 1 oz of Black Jacob wool for my spinner’s study, so you can expect a post showcasing the finished yarn and a new breed within a few days! This is the second cop of my Bugga fiber, I think I’m about halfway through the 4 oz. It’s amazing how long it takes to spin when you don’t work on it. 😉 I’m not sure why I’m procrastinating this one. I don’t really love the feel of the nylon, I think, and the fiber is somewhat compacted so it’s not as easy to spin as fluffier stuff. 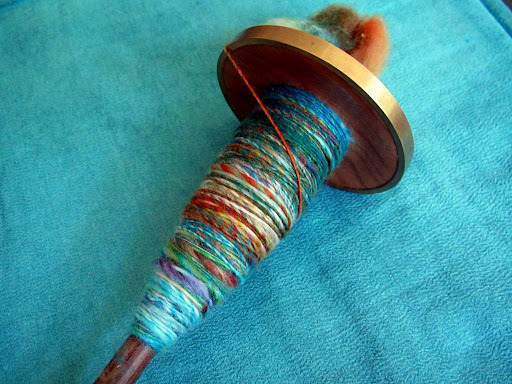 The colors are lovely and it is plenty soft, it’s just a little tricky to spin sometimes. I have been on the hunt for good bags for my spindles since I got them and finally found a couple at a cookware store! Go figure, right? I actually cannot fathom what these bags are actually intended for but they’re made of nice plastic-lined canvas, have velcro tops, and a handle and they are just the right size for a few ounces of fiber and a spindle so I dub them perfect spindle bags. How do you store/carry your spindles/spinning? 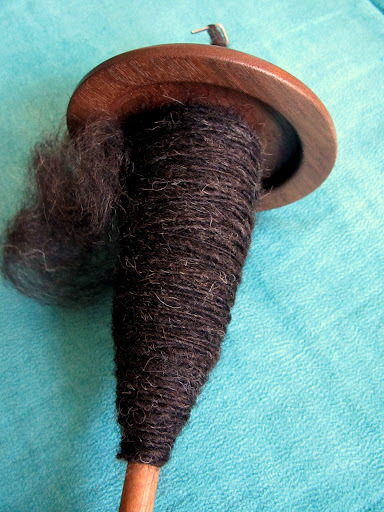 I'm hoping to pick up my first spindle at a fiber festival latter this summer. 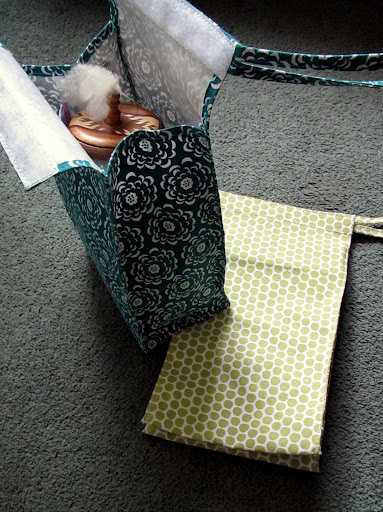 Those bags are really cute- are they tall enough to be gift bags for wine? Wine is the only thing I could picture fitting in them, although I don't think they would velcro over the top of a bottle. Confusing! I'm excited to see your first spindle! Spinning is really quite fun. I have a cute little kids purse with Pascal from Disney's Tangled I got from my Disney Rewards points. It's the perfect size for my spindle and some fiber! I love the color of the bugga, but you are right, it looks hard to spin. The Jacob looks so fuzzy and warm! I think they're lunch bags. Also, we need to have a date where I sit and spin for a while so I can see if I wanna get into it! I keep seeing other people's stuff and it looks so fun! So sorry to hear about the job interview, sounds like they don't deserve a reliable and capable person like you. Isn't Jacob just the most fun to spin? I actually spun some of that up and make a pair of socks for my mother earlier this year, it was loads of fun. I had no idea there was a Bugga fiber! THE COLORS! Trust me, you wanna get into it. 🙂 COME VISIT. I'm free this weekend, no joke. Your bag sounds cute, and way better than the ziplocs I was using before! It should definitely cower in fear, lol. I hear their merino/silk blend is even nicer.